The Georgeson Botanical Garden will celebrate the 166th birthday of its namesake with a birthday bash from 11 a.m. to 4 p.m. June 25 at the garden. The Georgeson Botanical Garden in full summer bloom. Activities will include a craft fair, raffle, educational stations on beekeeping, peonies and herbs, face painting for kids, food for purchase, a birthday cake and, of course, beautiful flowers to view. The Dry Cabin String Band will provide music at 1 p.m. and garden manager Katie DiCristina will announce a “birthday gift” pledge drive at 2 p.m. A garden sculpture of the herb anise hyssop will also be dedicated to longtime volunteer and herb expert Barbara Fay. Charles C. Georgeson was a plant breeder and agronomist who came to Alaska as the special agent in charge of the U.S. experiment stations in Alaska. He helped establish a series of stations, including the Fairbanks Experiment Farm in 1906, and he stayed to conduct research on livestock, grain and fruit. Georgeson was an enthusiastic supporter of agriculture in Alaska. to herb expert Barbara Fay during the birthday bash. 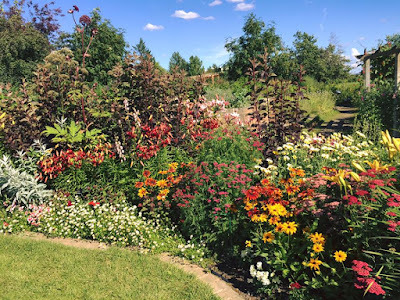 The garden is located at 117 W. Tanana Drive, about a mile west of the main University of Alaska Fairbanks campus. The Georgeson Botanical Garden Society and the School of Natural Resources and Extension are sponsoring the event. For more information, contact Mathew Carrick at 907-841-4907 or mtcarrick@alaska.edu.